Astronomers using the National Science Foundation's Very Large Array (VLA) radio telescope have found previously unseen evidence that galaxy collisions trigger energetic quasar activity in relatively nearby galaxies. New radio images of galaxies with bright quasar cores show that, though the galaxies appear normal in visible-light images, their gas has been disrupted by encounters with other galaxies. "This is what theorists have believed for years, but even the best images from optical telescopes, including the Hubble Space Telescope, failed to show any direct evidence of interactions with other galaxies in many cases," said Jeremy Lim, of the Academia Sinica Institute of Astronomy & Astrophysics in Taipei, Taiwan. Lim, along with Paul Ho of the Harvard-Smithsonian Center for Astrophysics in Cambridge, MA, reported their findings in the January 1 issue of Astrophysical Journal Letters. Quasars are among the most luminous objects in the universe, and generally are believed to be powered by material being drawn into a supermassive black hole at the center of a galaxy, releasing large amounts of energy. Many quasars are found at extremely great distances from Earth, billions of light-years away. Because the light from these quasars took billions of years to reach our telescopes, we see them as they were when they were much younger objects. These distant quasars are thought to "turn on" when the host galaxy's central black hole is "fueled" by material drawn in during an early stage of the galaxy's development, before the galaxy "settles down" to a more sedate life. However, other galaxies with quasar cores are much closer, and thus are older, more mature galaxies. Their quasar activity has been attributed to encounters with nearby galaxies -- encounters that disrupt material and provide new "fuel" to the black hole. The problem for this scenario was the lack of evidence for such galactic encounters in optical images of many nearby quasars. 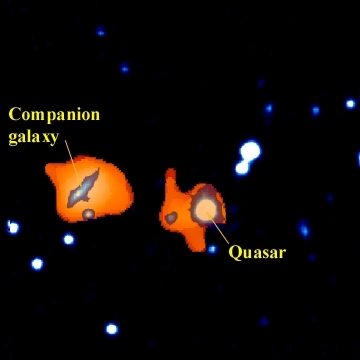 "Our VLA studies are the first to image the neutral atomic hydrogen gas in nearby quasar galaxies," said Ho. "This is important, because, in any galactic encounter, the gas is more easily disrupted than the stars in the galaxies, and the gas takes longer to return to normal after the encounter. This means we have a better chance of finding evidence of galactic encounters by imaging the gas using radio telescopes." The VLA can image the gas in such galaxies because it is particularly sensitive to the radio waves naturally emitted by hydrogen atoms. The researchers chose three quasars at distances of 670 million to 830 million light-years. The three galaxies surrounding these quasars had different appearances in optical images: one showed evidence of mild interaction with a neighboring galaxy; one appeared undisturbed but had a nearby neighbor; and the third appeared undisturbed and alone. When imaged with the VLA, all three showed strong evidence that their gas had been disrupted by an encounter with another galaxy. "This shows how well such radio images of the gas distribution in galaxies can reveal evidence of galactic interactions," Lim said. "We hope to make further studies and learn more about how these galaxy mergers actually stimulate the quasar activity." Quasars are among the most enigmatic objects in the universe. Though they appear on photographic plates made by astronomers more than a century ago, they looked like ordinary stars, and raised no curiosity. When radio telescopes were first used to make detailed maps of the sky in the 1950s, many strong sources of radio emission seemed to have no counterparts in visible light. In 1960, one of these bright radio-emitting objects was identified as a faint, bluish-looking "star" by astronomers using the 200-inch telescope on Palomar Mountain in California. That first quasar and others identified later puzzled astronomers because, when their light was analyzed to find the characteristic "signature" of emission at specific wavelengths shown by particular atoms, the pattern was at first indecipherable. In 1963, Maarten Schmidt of Caltech realized that the pattern made sense if the light's wavelength had been shifted through the Doppler effect by the object's motion away from Earth at greater velocities than had yet been seen. Because the universe is expanding, objects are moving away from Earth with greater speed at greater distances. The speeds seen in the quasars indicated that they were the most distant objects yet found, and, because they appear bright even at those great distances, must be extremely energetic. The idea that the tremendous amounts of energy released by quasars results from material being drawn into a black hole at the center of a galaxy quickly rose as the leading explanation. Galactic interactions were first proposed as an explanation for nearby quasar activity in 1972. Today, quasars are thought to be one of several types of active galactic nuclei, all of which are powered by central black holes. CAPTION: A combined optical-radio image of the quasar IRAS 17596+4221 and a companion galaxy. The orange areas are the hydrogen gas imaged by the VLA. In the optical image, there is no direct evidence for an interaction between the galaxy hosting the quasar and the companion galaxy. The extensions in the hydrogen gas, however, are a clear indication of disruption resulting from an interaction between the two galaxies. Credit: Jeremy Lim and Paul Ho; National Radio Astronomy Observatory and Associated Universities, Inc.